Who doesn’t love a parade? In my childhood days, the first parade of the year was for St. Patrick’s Day. And it often happened that there was snow on the street corners, and the wind was whipping and bitter; but the idea of summer existed, we welcomed the idea that winter would indeed end. We stood and cheered, and listened to the bag pipers and waved to friends marching along, and visited with neighbors you missed while hibernating all winter long. The next parade was the biggie, however. Decoration Day! (Now called Memorial Day.) I have old black and white photos of my Dad and Aunt Gael and various cousins as children at that parade, back in the 50’s. (There are no photos of us at most of the events of our childhood that I know about. There seems to have been a vacancy for ‘family photographer’ for years after Henri died and before I began.) The parade would pass by the front porch of 183 Victory, and we would watch with all of the older members of the family. We sat on the edge of the porch, we wandered up and down the stairs visiting with cousins and friends, we ran up and down the alley between the house and the funeral home. We had fun! We bought poppies from veterans, and waved our flags and marched along the sidewalk. I don’t recall when we stopped going to the parade every year; I am unsure of whether the parade stopped for a while, or when the stepping off point changed, or if it was simply that after the funeral home moved up Victory we no longer had front row seats and ample parking. But I do recall one year when Arlie was about 4, taking a folding chair and Daddy Gus to the corner of Hart and Forest and sitting him down to watch the soldiers and the bagpipers and the other marchers go by. I have a photo of Arlie and her little friend Molly, waving flags, and I remember Daddy Gus wiping the tears from his eyes as the bands played on. Ours is not a military family. We don’t have the old stories, the old soldiers who silently saved the world for us. But we do know what they do, and what they risk, and what they leave behind. We appreciate the sacrifices that their families make, we love the soldiers that we do know, who continue to make our world a safer place to live. This Memorial Day the parade of my youth is hundreds of miles north, and I will be at work, near a military base. But the meaning of the day, the sacrifice that our soldiers bear—it’s not something that can be measured, nor is it something that is to be left for one day in any event. Happy Memorial Day. Have a safe and happy summer, and remember the reason you have this time to spend with family and friends at the beach or BBQ or even, like me, at work…. An update on my studio cleaning. 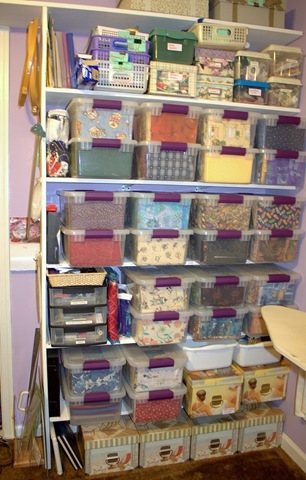 I have this photo of the fabric wall, completed. I chose not to remove works in progress from the smaller containers on the top shelves at this time. The bins they are in fit relatively well, so I am leaving well enough alone. 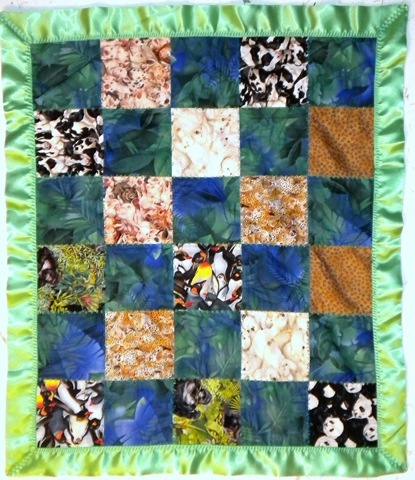 I also finished a little baby blanket for a co-worker’s grandson, a super-preemie born back in February, who will probably be coming home within the next month! 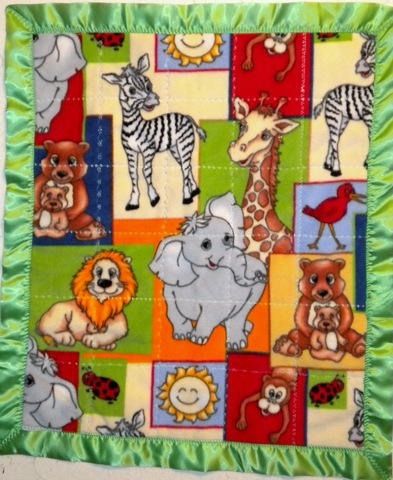 A simple patchwork blanket with fleece backing and blanket binding…a perfect snuggle for Alexander. There was a post the other day, I didn’t send out a reminder, scroll down to catch up! great! May I suggest that a white sheet hides the visual clutter and acts as a design wall. I strung mine on a small round curtain rod at the top of the shelving. The brackets were narrow and fit the shelving sides and use small nails. nice memories, thanks for sharing them. Having grown up in a rural area, I didn’t see many parades up close or personal. But I do have fond memories of watching parades on TV with my dad. He was a medic during WWII, serving in Germany and France.